As part of the James Watershed Based Plan planning process, a public survey of residents of the James River watershed was created and promoted for 2 months, from late August to November 2017. 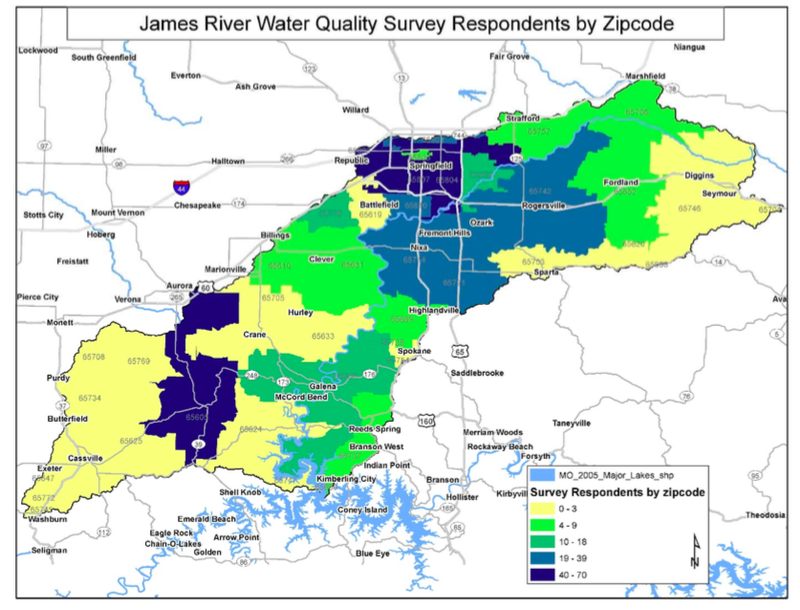 The map below shows how the 526 survey participants were distributed throughout the zip codes in the James River Watershed area. Residents were asked how many years they had lived in the James River watershed. Over 47% of the 526 survey respondents answered that they had lived in the watershed over 25 years with many of these being life‐long residents. 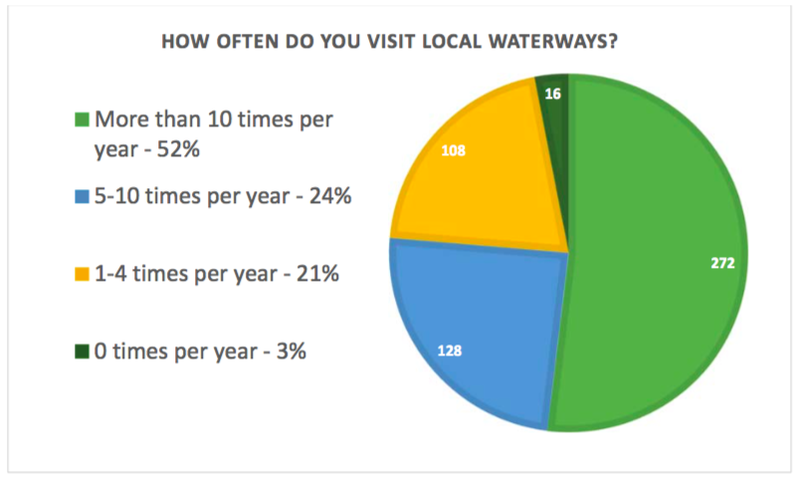 Over 50% of survey respondents use or visit the rivers, lakes and streams more than 10 times in a year. Listed activities and use of the lakes, rivers and streams by survey respondents was highly varied and many respondents listed 3 or more types of water/stream related activities. The James River is known for floating, fishing and hiking activities. Also, most of survey participants strongly agreed that access to clean lakes, river and streams was important to their quality of life. Only two were unsure of this. Over 80% of survey participants viewed water quality in the James River watershed as either good or fair quality for recreational purposes. Only 11% of participants ranked the water quality for recreation as poor or very poor. 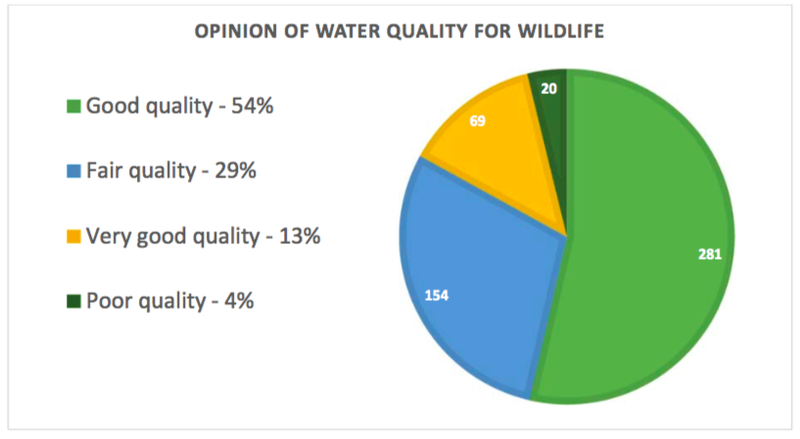 When asked their opinion of water quality in the James River for wildlife purposes, the survey participants ranked water quality higher than for other purposes with over 95% ranking the water quality as very good, good or fair. Nearly 50% of the James River Survey participants ranked water quality in the James River for drinking as fair. Those who ranked water quality higher or lower than fair were nearly equal. Factors shaping survey participant’s opinion of the water quality were heavily weighted toward personal experience and observation. Other factors included accounts of how the water and the River used to look and the decline of fishing opportunities. Survey participants were asked to rank the water quality impact of the listed pollutant sources to the James River, from 1 – less impact to 10‐ more impact. Each of the listed pollutant sources was also defined and described in a short paragraph. Participants more often ranked all listed pollutant sources as having a high impact on water quality. The graph below shows the results. Wastewater treatment plants collect and treat sewage from cities and towns like Springfield, Nixa, Ozark, Reeds Spring, Galena and others. The treated water is then discharged into creeks that flow into the James River. This treated water is known to alter the water chemistry of the receiving stream which can cause higher water temperatures, more algae growth, and added phosphorus and nitrogen concentrations which affects the biodiversity of stream life. Septic tanks are mainly used by rural households to treat their wastewater since rural areas have no access to municipal sewer service. The tank drains to a series of pipes that distribute the liquid out into the soil. Household septic tanks rely on the surrounding soil and its natural bacteria to clean up the wastewater. Since the Ozarks and the James River region contains a lot of thin, rocky soils that offer little to no absorption, there exists a potential for the household wastewater to leak down into the ground and flow into streams and springs with little treatment. Stormwater runoff is rainfall that flows over the ground surface. It is created when rain falls on roads, driveways, parking lots, rooftops, and other paved surfaces that do not allow water to soak into the ground. Stormwater runoff from urban areas causes nearby streams and rivers to flood faster compared to runoff from the same storm falling over a forested area. Stormwater runoff also picks up and carries with it many different pollutants that are found on paved surfaces such as oil, grease, nitrogen, phosphorus, bacteria, trash, pesticides, and metals. Erosion caused by stormwater runoff flowing across agricultural areas can be a source of pollution to nearby streams and rivers when the land is treated or managed without consideration for the impacts to the local watershed. Examples of this include: 1) the removal of vegetation all the way to the water’s edge which makes the streambank vulnerable to erosion and soil loss, 2) over‐grazing of livestock to deprive the soil of cover‐thus allowing for erosion during rain events, 3) over‐application of fertilizer or pesticide or application just before a storm‐event, 4) livestock and farm animals directly accessing the stream. De-vegitation, the removal of vegetation from a stream or river bank, leaves it vulnerable to erosion and loss of adjacent land while also increasing the amount of gravel in the stream bed. This in turn causes less area for water to flow in the stream and thus contributes to increased flood levels and more erosion of the stream banks, perpetuating the cycle of erosion downstream. Dumping of trash and litter into streams and rivers has long been utilized as a means of waste disposal. In the Ozarks, sink holes have long been considered a dump for unwanted waste items. However, streams, rivers and sink holes are all connected to our local water systems and litter disposed of in these locations presents both an unsightly problem and is hazardous to wildlife and recreational use. Besides solid waste, dumping of unwanted liquid waste such as old oil, paint or even manure can harm aquatic life, destroy fish populations and reduce recreational uses of the affected stream. James River survey participants were asked if they owned land (larger than 3 acres), a yard or neither. 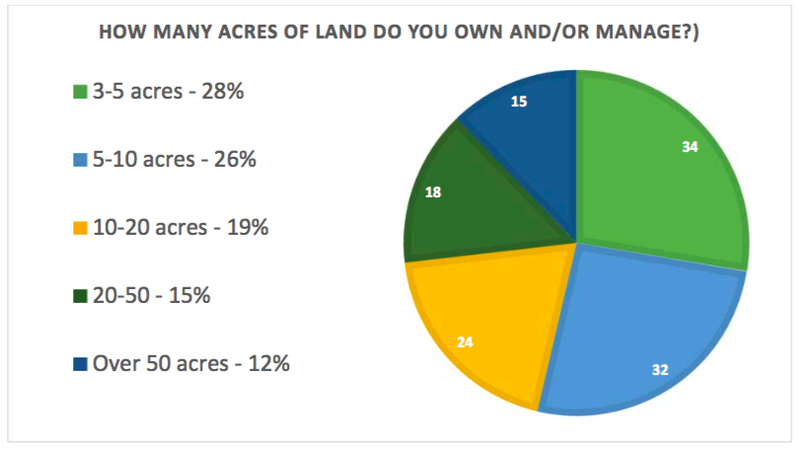 Of the 526 participants, 59 selected neither, 344 owned a yard and 123 or 24% stated that they owned more than 3 acres. The following charts show the 123 participants that selected more than 3 acres and their answers to the survey questions related to land management and water quality. Many land owners used their land for multiple purposes. A large percentage of participants grow gardens and maintain forested acreage. Septic tank pumping and maintenance of vegetative buffers along streams were the two most often used water quality conservation practices chosen by survey participants. 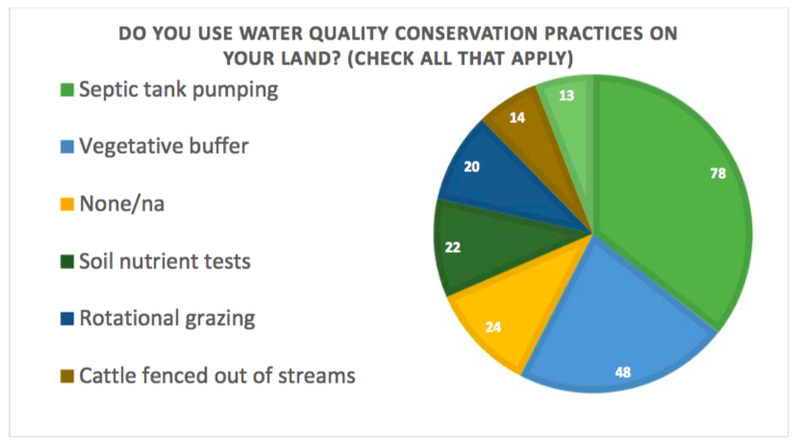 Protection of water quality was the main factor in participant’s choice to use conservation practices, followed by the effectiveness of the practice.